The last few moments may have been tense and anxious ones for everyone in the Green and White gallery but the DLSU Lady Spikers dug deep and even won the breaks of the game to register a season sweep of Ateneo, 25-17, 25-13, 25-23, Saturday at the Smart Araneta Coliseum. After breezing through the first two sets of the highly anticipated second round match-up courtesy of solid floor defense and committing less errors (14 vs. AdMU’s 16), La Salle suddenly found its once 22-17 lead get trimmed to just a single point, 22-21, after an ace from Ateneo’s Maddie Madayag. A huge break was gifted to the UAAP defending champions as the Ateneo front row was whistled for overreaching just a setter Michelle Cobb was setting-up Lourdes Clemente. The Lady Eagles responded with an attack from hitter Pongay Gaston to once again trim DLSU’s lead to just a single point, 23-22. Just as Clemente put the Lady Spikers at match-point, 24-22, after an attack, the University of Perpetual Help transferee bungled from the service area to hand a point once again to the Lady Eagles. Veteran Aduke Ogunsanya would not waste La Salle’s second match-point, scoring on a running attack to halt Ateneo’s 10-game winning streak. Aside from dictating the tempo of the game early, DLSU also negated Ateneo’s biggest strength as La Salle shutdown the league’s number one team in terms of blocking. Coming into the match averaging 2.62 kill blocks/set and featuring a line-up that consists of three of the league’s top four blockers, the Lady Spikers dominated the blocking department, 6-0, while also holding significant advantages in attacks (37-27) and service aces (8-3). Though they managed to commit only one less error for the whole game (23 vs. Ateneo’s 24), La Salle’s record remains unblemished whenever they have less miscues compared to their opponents. With 14 points, rookie Jolina dela Cruz once again took the game-high honors in scoring while Ogunsanya and Clemente proved to be up to the challenge of facing Ateneo’s tall frontline by producing 10 points each. May Luna was coach Ramil de Jesus’ magic “bunot” from the bench as the Davao native subbed-in for Tin Tiamzon midway through the first set and was an instant impact. 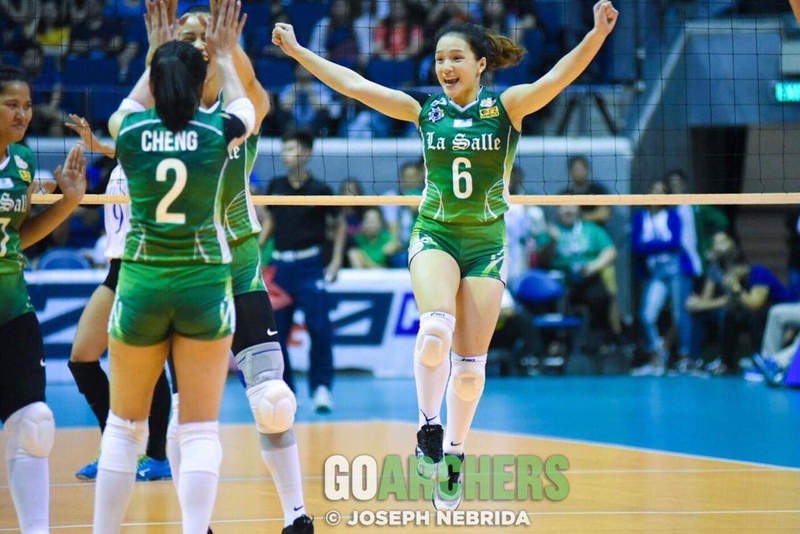 Her five-point explosion in a 7-0 run helped La Salle pull away from a slim 15-13 lead to an unassailable 22-13 one. Luna finished with a total of nine points, including three from the service line. Starting libero CJ Saga personified the effort and efficiency of DLSU’s solid floor defense, tallying one of her finest performances and taking home player of the game honors with 21 excellent digs and 14 excellent receptions. The second set was one of the most dominant one for La Salle as they held the Lady Eagles to only three attack points while building the game’s biggest lead of 11 at the 18-7 mark. Notes: With the win, the Lady Spikers not only improved their record to 9-3 but also formally clinched a spot in the Final Four with two games remaining. Including the finals of UAAP Season 79, this is also the 6th straight win for the Lady Spikers over their Katipunan counterparts, including the 25-14, 25-17, 16-25, 25-19 win during this season’s opening weekend. The Lady Spikers’ campaign resumes after the Holy Week as they take on the UE Lady Warriors on April 24, 2PM at the Filoil Flying V Center.